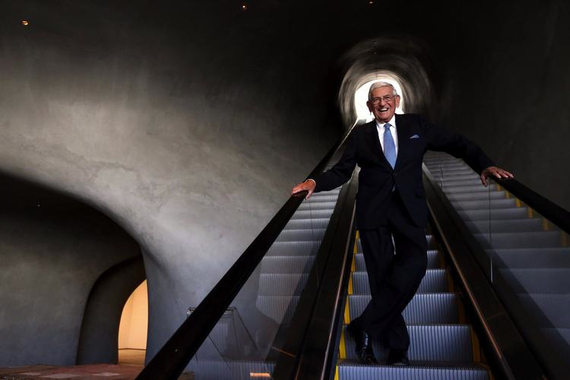 This interview was conducted with Eli Broad at The Broad Museum on Wednesday, June 8, 2016 at The Broad's exhibition preview celebrating the opening of their first special exhibition, Cindy Sherman: Imitation of Life. You've built two Fortune 500 companies. I did--in two different industries. KB Home, formerly Kaufman & Broad and SunAmerica. Thank you. If you were starting out today as an entrepreneur, how would America look like to you as a country? Very different than when I started almost 60 years ago. Sure. Is the environment for an entrepreneur significantly easier or harder from when you started? I think it's easier with technology. The number of young people with electrical engineering degrees is truly revolutionary. It's been reported that in 2014 alone, Millennials launched nearly 160,000 startups and they make up nearly one-third of all entrepreneurs in the U.S. What advice would you give to young entrepreneurs? Be creative. Don't accept the status quo. There's a quote from George Bernard Shaw that said, "Reasonable people adapt themselves to the world. Unreasonable people attempt to adapt the world to themselves. All progress, therefore, depends on unreasonable people." Moving away from business for a moment, let's talk about the primary reason we are here today. Cindy Sherman: Imitation of Life is the first major museum show of Sherman's work in Los Angeles in nearly 20 years, as was mentioned in the opening remarks this morning. And, I might add, it's the most comprehensive exhibition ever of her work. Indeed, thank you. The Broad houses over 2,000 works of contemporary art in a collection you and your wife amassed over five decades. ANd you've been quoted as saying that Los Angeles is the contemporary art capital of the world. Why do you feel it's important for people to have access to contemporary art? Well, it [contemporary art] reflects what is happening in our time. It stimulates creativity and thoughtful thinking. Your work in philanthropy through The Broad Foundation is focused on three primary areas 1) Education 2) Science and Medicine and 3) The Arts. What inspired you to choose these three areas of focus? In the Arts, we've collected for many years and we decided to create an art foundation and museum to share it with the broadest possible public. Then, when I left the world of business, I said what is the biggest problem facing America? I said it's really K-12 education. We traveled the world and saw what was happening in Japan, China, Korea, India and in Northern European countries. It was clear to us that we weren't doing a great job at educating our youth. So we got involved in education in many different ways. Whether it was Teach for America, charter schools, we created something called The Broad Superintendents Academy (BSA) and The Broad Residency. So we trained many people and I think we're making a difference. It's a tough are because you have a lot of people that don't want change. Whether it's administrators, bureaucrats or the teacher's union--they want to leave things the way they are. So it's been more challenging. Then, we got involved in the scientific and medical research which has been a joy. We have The Broad Institute and partnered with Harvard and MIT which is now number one in the world in genomics with a $400 million annual budget with 2,000 people involved. We're involved in three stem cell centers in California 1) USC 2) UCLA and 3) UCSF. And these things are making a difference on the human condition. You're regarded as one of the most prominent figures in Los Angeles. What inspired you to become so involved in your community? Los Angeles has been very good to us. It's a meritocracy. It's the one city where you can go and if you have ideas and energy, you're accepted. That isn't so in many cities in the America or in the world. So, we want to give back. That's what we're about--giving back. Thank you and my last question. In a few words, what advice would you give to your younger self? Work hard. Do a lot of research. I read four newspapers every day. I follow The Huffington Post. I've always had a thirst for knowledge. Stay hungry for knowledge.